All the components of the system are perfectly engineered to match each other and are completely waterproof. State-of-the art monitoring technology with pilot lines and insulation monitors safeguard the high-voltage system against the risk of short circuits. The same high-performance lithium batteries used to power cars also power Deep Blue – after we developed them further for use in boats. These and many more safety and performance features make Deep Blue a unique high-voltage propulsion system for electric boats. And if that's not enough – we provide a 9-year warranty on the Deep Blue's battery capacity, that's right, 9 years. Electric boat propulsion is not only powerful and safe, it is also a genuine commercial alternative for heavy users in particular. Whether the 40 HP or 80 HP version – switch to full electric power! The Deep Blue i 1400 rpm is the "planer" at your side. Available as 40 HP or 80 HP equivalent depending on requirements. a reliable battery lifespan is key for electric boating economics. That is why the Deep Blue battery comes with a long-term battery capacity warranty: 9 years after commissioning, the batteries will still have 80 % of their original capacity, even if you use them every day. * Battery ageing is transparent and can be tracked by the user in the on-board computer at any time. * Adherence to warranty conditions required. See Deep Blue battery capacity warranty at www.torqeedo.com for more details. 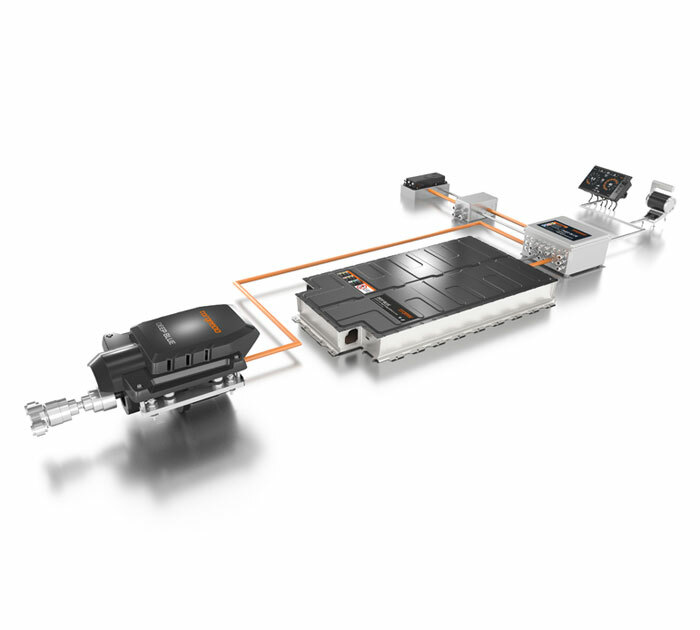 Low-maintenance system: switching makes sense from as little as EUR 4,500 in annual fuel costs – contact us for more information. BMW i battery: latest battery generation from BMW i3 and BMW i8 series. Very high energy density, durable, robust, highest level of quality and safety. The Torqeedo Deep Blue's on-board computer calculates the remaining range constantly, by linking the motor's consumption data with the charging level of the batteries, and the speed over the ground from the GPS. This allows you to read the remaining range in real time from the motor display or the smartphone app TorqTrac. Outboard: outboard with remote steering and throttle, available as 40- or 80-HP equivalents, various shaft lengths. Models: Deep Blue 25 RL / RXL and Deep Blue 50 RL / RXL. Outboard with tiller: outboard with tiller for steering and throttle, available as 40- or 80-HP equivalents, various shaft lengths. Models: Deep Blue 25 TL / TXL and Deep Blue 50 TL / TXL. Inboard: inboard with drive shaft, available as 40- or 80-HP equivalents, various motor speeds. Models: Deep Blue 25 i 1400 / 1800 and Deep Blue 50 i 1400 / 1800. Sail Drive: sail drive with remote throttle, available as 40 HP equivalent. Models: Deep Blue 40 SD. When is it worth switching to the Deep Blue? Switching could make sense for you from as little as EUR 4,600 in annual fuel costs. Are your fuel costs higher than EUR 4,600 per year? If they are, it might be worth switching to the Deep Blue today. The Deep Blue will in any case protect you from the expected increases in fuel prices. And you will be setting an example for economic reason while showing respect for nature and demonstrating how we can retain mobility in increasingly difficult ecological conditions – more quietly, more cleanly and with greater environmental awareness. The Deep Blue has a 2-year warranty from the date of purchase for non-commercial use. * Adherence to warranty conditions required. See Deep Blue battery capacity warranty at www.torqeedo.com www.torqeedo.com for more details. Would you like us to contact you to discuss this propulsion system without obligation? If you are interested in this product, we would like to send you some further information. Please subscribe to our contact form shown below and we will contact you immediately.